Discussion in 'International Politics' started by omya, Nov 7, 2017. India has committed $500 million to the Chabahar port that it is building as a way to bypass rival Pakistan and crack open a trade and transport route to landlocked Afghanistan, as well as the resource-rich countries of central Asia. New Delhi: India is in talks with Iran to begin interim operations at a port in southeast Iran, officials say, proceeding cautiously on developing the facility at a time when the Trump administration has laid an aggressive new approach toward Tehran. New Delhi plans to send seven shipments of wheat to Afghanistan through Chabahar by the end of January. A first shipment arrived last week from India's western Kandla port, after years of political wrangling with Pakistan, government officials in New Delhi and Kabul said. The wheat will be trucked from Chabahar to western Afghanistan. India is expanding its economic diplomacy in Afghanistan, seeing itself as a regional power. But Pakistan says India is trying to use Afghanistan as a base to destabilise Pakistan, and has long blocked India from conducting bilateral trade with Afghanistan using its territory as transit. The shipments are meant to demonstrate the route's viability, officials said, and the plan is to broaden the cargo flow before the port is fully operational by the end of next year. "Things are moving quite well and as planned," Saurabh Kumar, Indian ambassador to Iran, said in an email. So far, the United States, keen for India to do more to help stabilise Afghanistan through economic and security assistance, has held off public criticism of renewed Indian efforts to develop the Iranian corridor. India's ties with Iran came up during U.S. Secretary of State Rex Tillerson’s talks in New Delhi last month, and the top U.S. diplomat said America would not stand in the way of projects that help the Iranian people. But he warned that the administration would crack down on financial benefits accruing to the Iranian Revolutionary Guard, the country's most powerful security entity, blamed for fuelling regional proxy wars. India has framed its involvement in Chabahar's development as primarily about establishing a gateway to Afghanistan, more than Iran itself, Indian officials and a Western diplomatic source said. 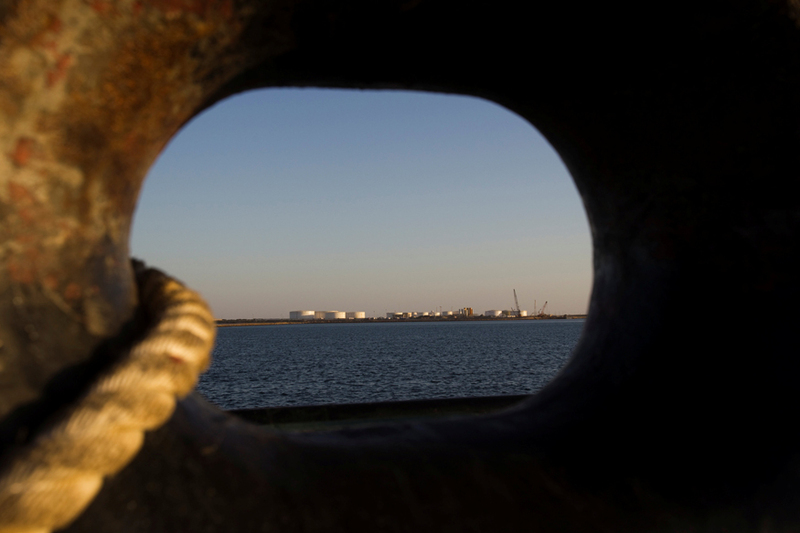 Washington has not intervened directly in the port's development, but, previously, India drastically cut back its oil imports from Iran, one of its main suppliers, in the face of international sanctions on Tehran for its suspected nuclear programme. "In general, I get the impression that conservative analysts in (Washington) DC have accepted the fact that India will maintain some form of relationship with Iran," said Jeff Smith, a south Asia expert at The Heritage Foundation in Washington. "They recognize that for India, Iran is more about a transport corridor to Afghanistan; that it has no interest in advancing Iran's agenda in the Middle East; and that whatever space India evacuates there will be filled by China." An Indian government source said India Global Ports Ltd (IGPL), a company set up by the government to lead the Chabahar project, had held talks with Iranian authorities to begin interim operations. In August, IGPL applied for permission to establish a company to run the port, the source said. The plan is for IGPL to build two new terminals, one for container vessels and one for multipurpose ships. After some delay, IGPL awarded contracts last month for port construction equipment such as cranes, the source said. Iran, meanwhile, had completed the construction of a jetty. "We are moving slowly, but there is movement on the port development despite U.S.-Iran relations deteriorating," said Meena Singh Roy, an expert on India-Iran ties at the government-funded Institute for Defence Studies and Analyses. Gessler and randomradio like this. Iran has a highly important strategic location. Both India and China need Iran if our transit corridors have to work out. India needs to invest in cargo ships to fully exploit this route. And India should involve USA Japan Israel etc in Exploiting this route. And link this to Asia-Africa Corridor, a alternative to OBOR. But the problem is IRAN and Israel are at each others throats. IRan is also difficult to deal in money terms. After winning the war in Syria, Iran will now move towards SA and the present turmoil to grab power by present Prince will see to it that SA gets hammered by Hezbollah, Syria & Iran with rebels within SA. I so jealous of the Iranians. The way they are conquering their surroundings. When will we be on the same level? Iran is a feature enemy for us, unless we can make both Pakistan and Iran fight eachother. Pakistan will come to SA's aid. Or do you think Pak will ditch SA because of it loosing its oil sheen or keep going because of ideological reasons? Our west will be an unpredictable hotspot once America exits.